What is Cross Platform Development? Home » Resources » Mobile Apps » What is Cross Platform Development? In the world of mobile app development there are different device platforms that you have to build for (Apple vs Android). Traditionally apps for each of these platforms must be built separately because each operating system uses a different code language not recognized by the others. But what if you could actually program in one universal language that could be used by different devices? Let’s look at the idea of “cross platform development” in detail below, including advantages and disadvantages of using it. Expense: Creating and maintaining an app for each operating system is much more expensive. Knowledge: Programming native mobile apps would require high levels of skill in 2-3 different languages. Uniformity: Because each platform has its own user interface, standardized widgets and features, apps will not be uniform from platform to platform and will create a different user experience depending on the device. Many people have more than one type of device so when they use your app on iOS and switch over to an Android device, their experience will be different. Native App – Cross Platform Development – Using tools like React Native, Xamarin, or NativeScript, you end up with an app that still uses native APIs which allows for excellent performance across all platforms, without having to code each separately. This results in a very nice app that runs well and is a great compromise over the time and expense of building a native app. Expenses are reduced as the need to code in two or three separate languages disappears. In addition bugs that are present in the common code base need only be fixed once (for the most part). Time to market is reduced since developing one program takes a lot less time than building two or three apps for each device platform. Uniformity increases between different operating systems creating a more seamless user experience. Companies are able to reach many more customers right from the get-go which increases exposure and future ROI. The development tools are familiar as they employ common programming languages. It is ideal for prototyping because it allows a faster time to market on more than one platform and allows the owner to collect user feedback, establish a position in the market and secure any patents if necessary, before another company can do the same. In the case of apps used by employees, cross platform apps can help you achieve quicker deployment and adoption at a lower cost, since bring your own device (BYOD) policies are becoming more and more common in the workplace. Programs can be less efficient. This occurs due to lack of hardware power to perform smooth HTML5 animations on low or mid range devices, redundant processes for the different platforms, or running on operating systems that are more than 3 years old. The program itself may need to be more generalized and in the process become less sophisticated than it would if it were built for one specific program. Using advanced features with cross platform development may take more battery power and a lot more resources than with a native application. Would You Like to Learn More About Cross Platform Development? At ClearTech Interactive we realize that each customer has unique needs and requirements for their new mobile app. This is why we offer a variety of ways to build your next mobile app, including cross platform development options. Since 2003 we’ve built thousands of projects for our clients. 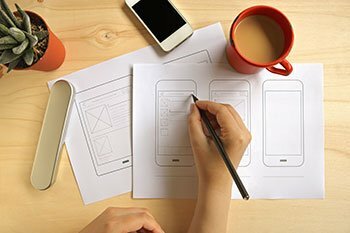 We can explain the various options available in building a mobile app, including cross platform development options. We offer a free consultation ($250 value) to discuss your mobile app idea. Request a Call or contact us at 727-562-5161 to find out what we can do for you. ← How Much Does it Cost to Build a Mobile App?